Emma Charlesworth-Seiler, center, is the second woman to umpire in the Gulf Coast League in two years, following Jen Pawol in 2016. At a Brooklyn ballpark near the Atlantic Ocean on a Monday night in late June, second-year umpire Jen Pawol, 40, called balls and strikes in a Class A New York-Penn League game. 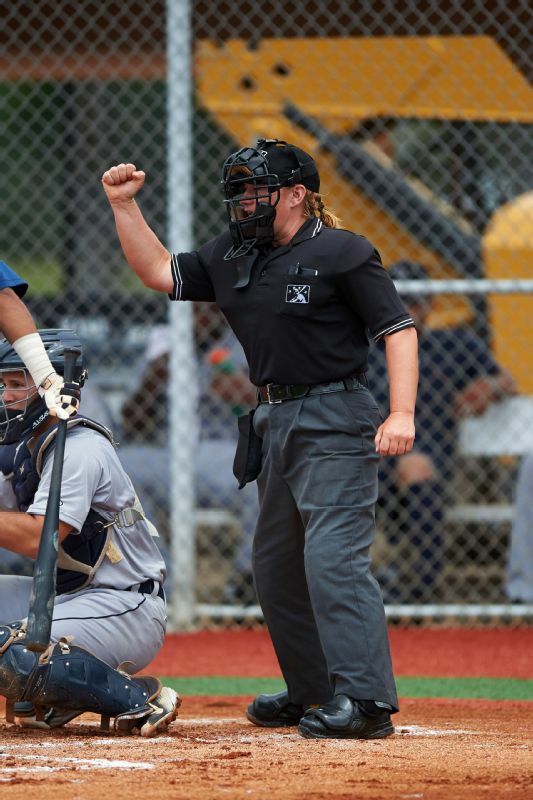 The next morning, a thousand miles south at the New York Yankees minor league complex in Tampa, Florida, 22-year-old Emma Charlesworth-Seiler stepped onto the field for her professional umpiring debut in the Gulf Coast Rookie League -- the same league where Pawol umpired last year. The significance? For just the second time in minor league history, two women are umpiring in affiliated leagues at the same time. The first was in 2004. Pawol's and Charlesworth-Seiler's simultaneous work represents progress in a sport where women have been opposed and often harassed for trying to officiate since Bernice Gera, the first female umpire in professional baseball, sued to work in the New York-Penn League in 1972. There has yet to be a woman umpire in Major League Baseball since Gera opened the door for women to officiate in the minors more than four decades ago. Before Pawol and Charlesworth-Seiler, only six other women umpired in the affiliated minor leagues -- that is, leagues with farm teams for major league clubs. A handful of other women have umpired in independent leagues. Only one woman umpire has risen above Double-A: Pam Postema, who spent seven years in Triple-A and worked major league exhibition games in spring training before being fired in 1989. While other female umpires followed Gera since 1972, Pawol's hiring ended a seven-year streak -- from 2008 to 2015 -- in which no women umpired in the minors. Jen Pawol umpired in the Gulf Coast League in 2016 before moving on to the Class A New York-Penn League this summer. It's still too early to know whether Pawol or Charlesworth-Seiler will be the one to break MLB's glass ceiling, given that it normally takes six to eight years for an umpire to be considered for the majors. But their hiring is a step forward in baseball's effort to diversify its major league umpiring staff -- a group that has been traditionally male, and largely white. 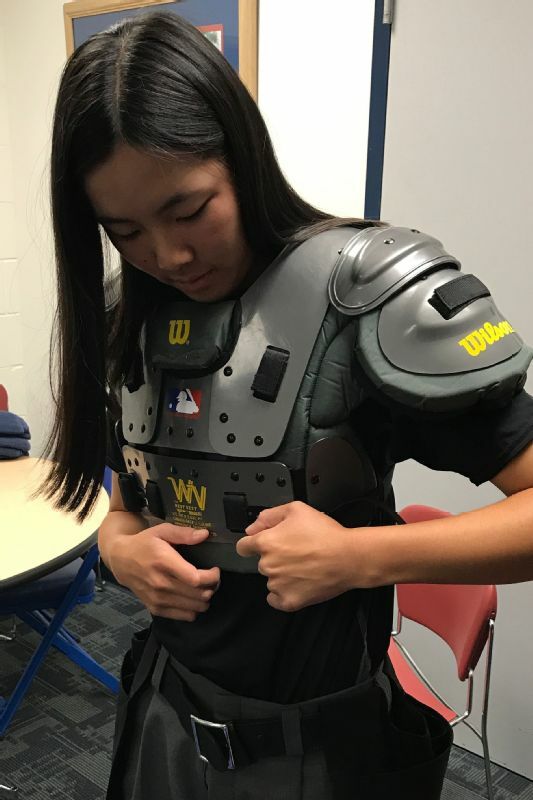 "Whether women or men, I don't think we did a good job of recruiting officials into the profession to begin with," said Dusty Dellinger, director of umpire development for Minor League Baseball (MiLB). "So far, things have been good for Jen. She's on par for the level that she's at. She's doing nicely. And we expect much of the same with Emma. But I can tell you they've earned every opportunity they've been given." Baseball is behind the curve of other professional sports in the hiring and promotion of women officials. The NBA broke its gender barrier in 1997 with Dee Kantner and Violet Palmer. Neither remains in the league, but the NBA did promote Lauren Holtkamp from the D-League in 2014. Even the NFL hired its first woman official, line judge Sarah Thomas, in 2015. MLB has had women as full-time scouts (Amanda Hopkins in Seattle) and coaches in the Instructional League (Justine Siegal for Oakland in 2015) ... but not umpires. Until about 10 years ago, MLB left the responsibility of identifying and training prospective umpires to independent schools run by former umps Harry Wendelstedt and Jim Evans -- neither of whom placed much effort into recruiting. Then in 2006 the league opened the first of its Urban Youth Academies in Compton, California. Created primarily to encourage inner-city kids to play baseball, the now-seven academies had a broader recruiting purpose. 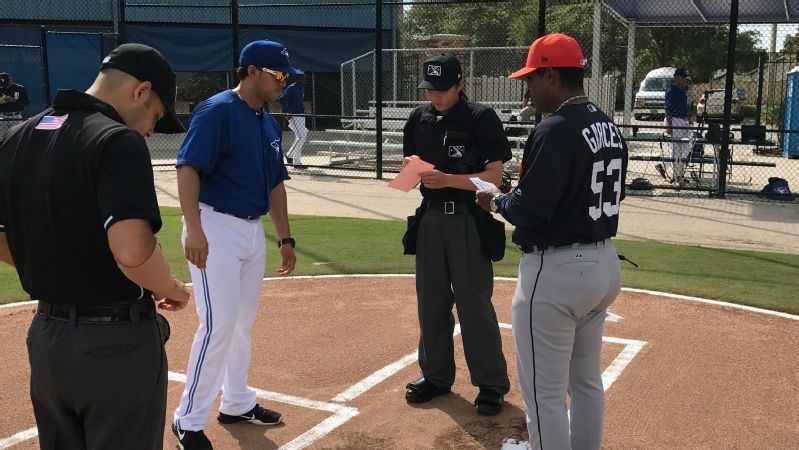 "The thought was, train players, coaches, managers, groundskeepers, scouts and broadcasters," said Rich Rieker, MLB's director of umpire development and a former big league ump. "Umpires are a natural part of that." That same year, MLB started a camp in Compton for prospective umpires. Eventually, MLB expanded it to a series of free regional camps around the country. Rieker said MLB brings 25 or 30 prospects from those camps to a minicamp in Fort Myers after Christmas, at MLB's expense. Promising candidates move on to the Wendelstedt School or Minor League Baseball's own umpiring training academy, which was founded in 2012. Eight go on scholarship, four to each school. Others have to pay their own way. Then the best from the schools are hired to work in the minors. Rookie MLB ump Carlos Torres, who attended a regional camp in 2008, became the first to rise to a major league job through that process. It's also how MiLB and MLB discovered Pawol, a terrific athlete who turned to umpiring to stay in the game. A former softball star at Hofstra University, where she batted .332 in three seasons while making all-conference every year before eventually competing for USA Baseball and in the National Pro Fastpitch League while teaching art at various places, Pawol began umpiring about 12 years ago. "I loved thinking the game as an umpire," she said. "I just fell in love with it. I thought, this is the next stage of my career I'm going to go after." Two years ago Pawol decided to start an umpiring school for teens, so she signed up for a camp in Georgia to learn drills she could teach. Major league umpire Ted Barrett was an instructor at that same camp. He asked Pawol if she had ever considered being a professional umpire, which puzzled Pawol, who at the time was already umpiring Division I softball. "I'm like, I am a pro umpire," she said. "This is as much as any woman could do in my mind, the max. I was living what I thought as far as that road could go, and that would be the rest of life. "When he invited me, he goes, 'No, no. I've been watching you. You're athletic. You know the game. You definitely love it. Why don't you try out in front of the major league umpire camp program and try to compete for a scholarship to umpire school?'" Pawol attended the Cincinnati clinic in August 2015, then moved on to Fort Myers where she earned a scholarship to the MiLB Umpire Training Academy in Vero Beach on the former Dodgertown campus. Dellinger then hired Pawol for the Gulf Coast League in 2016 as affiliated ball's first female umpire since 2007. "Because of my gender, I thought it was an unwritten thing that women weren't wanted," Pawol said. "My experience has been absolutely the opposite." Charlesworth-Seiler's rise has been extraordinary. Adopted from China as a 6-month-old, Charlesworth-Seiler grew up in the Minneapolis suburb. Baseball was her thing. She attended her first Minnesota Twins game when she was 7 in May 2002 (it was a loss to the Yankees) and played baseball every chance she could. "I love baseball," she said. "Ever since I was a kid, growing up with the Twins, loving baseball history. ... It was just baseball all the way. I didn't play softball. It really didn't appeal to me. Baseball just stuck with me." She was coaching in the local Little League three years ago when the league, short of umpires, asked for volunteers. Charlesworth-Seiler, then 19, jumped in. "It wasn't anything serious," she said. "I started with really little kids. I'm standing behind the mound and they're pitching the ball with a machine." Charlesworth-Seiler was umpiring 12-year-olds the next summer when she discovered there was an upcoming national girls' youth tournament run by Baseball for All, a non-profit founded by Siegal, the first woman employed for a major league team, that encourages girls to play baseball. The tournament needed umpires, especially women umpires. "I thought, 'Wow, wouldn't that be cool?'" Charlesworth-Seiler said. "So I sent her an email." Unbeknownst to Charlesworth-Seiler, Dellinger, Rieker and Cris Jones, who heads MLB's umpire scholarship program, were conducting an umpiring clinic at the tournament. They noticed Charlesworth-Seiler and started giving her pointers. "I had no idea who they were," she said. "For a couple of days, in between games and even in between innings, they tried to teach me things. I had never worked a two-umpire system before. Every game, I would go back out there and try to change those things." At the end of the tournament they invited her to the Fort Myers minicamp, skipping the regional process -- at which point, she had never umpired so much as a high school game. 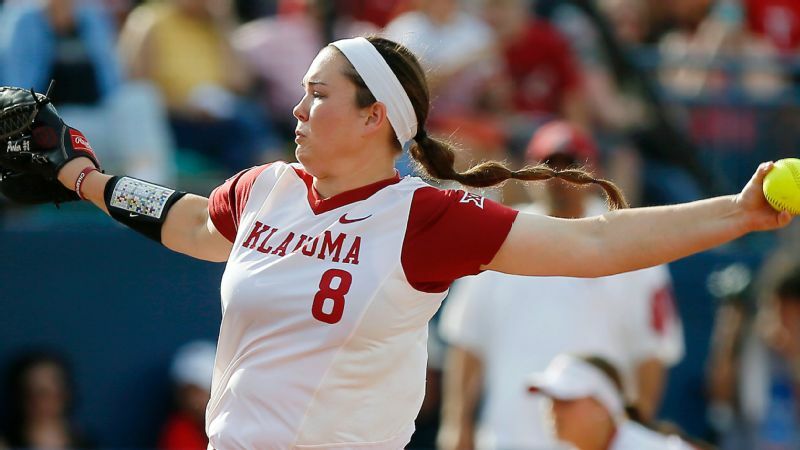 "The fact that she played the game, that's also a plus, whether softball or baseball," Rieker said. Emma Charlesworth-Seiler went from umpiring in her local Little League to the Gulf Coast League in three years time. Charlesworth-Seiler stood out in Fort Myers. But she asked to delay umpiring school so she could finish her degree at Hamline University in St. Paul and play a season of pro baseball in Australia. Last winter Charlesworth-Seiler returned to Fort Myers, earned a scholarship, impressed at the Dodgertown school and landed a GCL job. 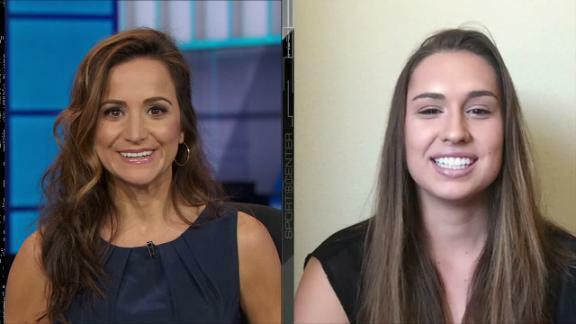 "The one thing that struck me with Emma was how coachable she was, and how she was able to correct any deficiencies she's had," Dellinger said. "That's held true since that time she's come to the school. "I think that bodes well for her as she continues on the pathway of hopefully achieving her goal and making it to the major leagues." That pleases Siegal, who believes MLB is serious about recruiting and promoting women umpires. "I definitely think Major League Baseball and Minor League Baseball have put forth an effort to create more diversity and include more women in the umpiring ranks," Siegal said. Pawol and Charlesworth-Seiler said they haven't experienced any of the harassment reported by previous women umpires. No one has left a frying pan for them on home plate, which famously happened to Postema, or made crude comments. "Being from New York, I know when I'm not welcome," Pawol said. "I've felt welcomed, with a lot of enthusiasm from my colleagues, other minor leaguers and my supervisors." Added Charlesworth-Seiler: "The people higher up set the tone. 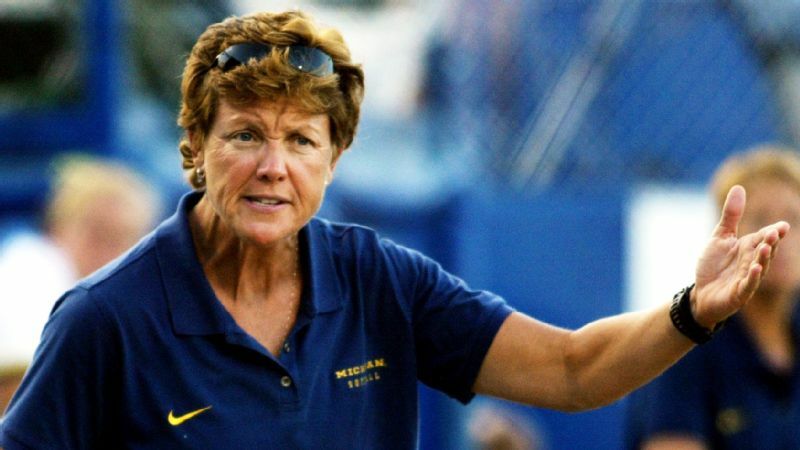 They're treating you as if you're an umpire, not a female umpire." Rieker, who met his wife, Kathleen, when both umpired Khoury League games in the greater St. Louis area, believes MLB is finally ready for its first woman umpire. But it won't be this year or next. Even the most proficient umpiring prospects spend a season or two at the six minor league levels: rookie ball, short-season Class A, low Class A, high Class A, Double-A then Triple-A. Triple-A prospects work the Arizona Fall League and spring training, with the best filling in for major league umps on vacation -- an option that did not exist in Postema's time. "Make no mistake about it -- Jen and Emma do have somewhat of a long road ahead, but a fun road working throughout the minor leagues to get the repetitions and training they need," Rieker said. "I'm ready, and I think Major League Baseball will be, too."